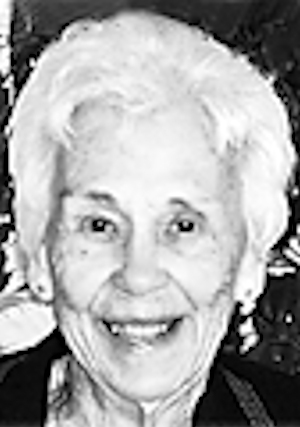 Obituary – Evans, Opal Winifred (McFarland) « Perry High School Alumni Association, Inc.
– daughter of Mr. and Mrs. Jo McFarland was born June 11, 1918, in Kiefer, Oklahoma. She attended school at Beggs, Kiefer, Bristow and Perry. While in school she received a silver loving cup for the best all-round student in the 8th grade graduating class. She appeared in the Junior Class Play, and is a member of the National Honor Society, and the State Honor Society for three years. Following graduation she expects to attend college at the Central State Teacher’s College at Edmond. She is especially interested in physical education and likes tennis, basketball and baseball. Opal McFarland Evans passed away Friday, May 29, 2009, at home, surrounded by her family. She was born June 11, 1918 in Kiefer to James and Mabel Walker McFarland. She graduated in 1936 from Perry High School and attended Central State College in Edmond. She was preceded in death by her husband of 63 years, Kenneth F. Evans, Sr., and one son, Ken Evans, Jr.
She is survived by her daughters, Karen Evans of Hutchinson, KS and Kathy Tatum, of Madisonville, TX eight grandchildren, 13 great-grandchildren, one great-great-grandchild, sister, Wanda Phillips of Midwest City and brother, James McFarland of Claremore. Mrs. Evans had been an active member of the Chimney Hill chapter of DAR in Ada. She served as an officer on the local, state, and national levels and received numerous awards for her services. Graveside services will be held Tuesday, June 2 at the Pleasantview Cemetery in Sumner at 11:00am. Visitation will be held Monday from 6:00 to 8:00pm at Perry Funeral Home. In lieu of flowers, contributions may be sent to Hospice and Home Care of Reno County, 1600 N. Lorraine, Suite 203, Hutchinson, KS, 67501.